1. Uzzo RG, Novick AC. Nephron sparing surgery for renal tumors: indications, techniques, and outcomes. J Urol 2001; 166:6-18. 2. Gill IS, Desai MM, Kaouk JH, et al. Laparoscopic partial nephrectomy for renal tumor: duplicating open surgical techniques. J Urol 2002; 167:469-476. 3. Gill IS, Matin SF, Desai MM, et al. Comparative analysis of laparoscopic versus open partial nephrectomy for renal tumors in 200 patients. J Urol 2003; 170(1):64-68. 4. Coll DM, Uzzo RG, Herts BR, Davros WJ, Wirth SL, Novick AC. 3-dimensional volume rendered computerized tomography for preoperative evaluation and intraoperative treatment of patients undergoing nephron sparing surgery. J Urol 1999; 161(4):1097-1102. 5. Gill IS, Delworth MG, Munch LC. Laparoscopic retroperitoneal partial nephrectomy. J Urol 1994; 152:1539. 6. McDougall EM, Elbahnasy AM, Clayman RV. Laparoscopic wedge resection and partial nephrectomy-the Washington University experience and review of literature. J Soc Laparoendosc Surg 1998; 2:15. 7. Janetschek G, Abdelmaksoud AA. Laparoscopic wedge resection for renal cell carcinoma. Curr Opin Urol 2003; 13(3):203-208. 8. Kozlowski PM, Winfield HN. Laparoscopic partial nephrectomy and wedge resection for the treatment of renal malignancy. J Endourol 2001; 15(4):369-374. 9. Janetschek G, Abdelmaksoud A, Bagheri F, Al-Zahrani H, Leeb K, Gschwendtner M. Laparoscopic partial nephrectomy in cold ischemia: renal artery perfusion. J Urol 2004; 171(1):68-71. 10. Landman J, Venkatesh R, Lee D, et al. Renal hypothermia achieved by retrograde endoscopic cold saline perfusion: technique and initial clinical application. Urology 2003; 61(5):1023-1025. 11. Gill IS, Abreu S, Desai M, Steinberg A, Ng C, Banks K, Kaouk J. Laparoscopic ice slush renal hypothermia for partial nephrectomy: the initial experience. J Urol 2003; 170(1):52-56. 12. Hayakawa K, Baba S, Aoyagi T, et al. Laparoscopic heminephrectomy of a horse shoe kidney using microwave coagulator. J Urol 1999; 161(5):1559-1562. 13. Jackman SV, Cadeddu JA, Chen RN, Micali S, Moore RG, Kavoussi LR. Utility of the harmonic scalpel for laparoscopic partial nephrectomy. J Endourol 1998; 12(5):441-444. 14. Elashry OM, Wolf JS, Rayala HJ, McDougall EM, Clayman RV. Recent advances in laparoscopic partial nephrectomy: comparative study of electrosurgical snare electrode and ultrasound dissection. J Endourol 1997; 11(1):15-22. 15. Gill IS, Munch LC, Clayman RV, et al. A new renal tourniquet for open and laparoscopic partial nephrectomy. J Urol 1995; 154:1113. 16. Caddedu JA, Corwin TS. Cable tie compression to facilitate laparoscopic partial nephrectomy. J Urol 2001; 165:177-178. 17. Terai A, Ito N, Yoshimura K, et al. Laparoscopic partial nephrectomy using microwave tissue coagulator for small renal tumors: usefulness and complications. Eur Urol 2004; 45(6):744-748. 18. Gettman MT, Bishoff JT, Su L-M, et al. Hemostatic laparoscopic partial nephrectomy: initial experience with the radiofrequency coagulation - assisted technique. 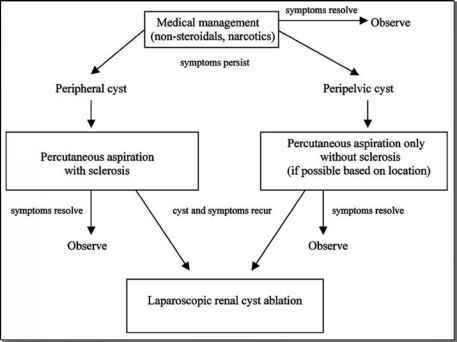 Urology 2001; 58:8-11. 19. Ogan K, Jacomides L, Saboorian H, et al. Sutureless laparoscopic heminephrectomy using laser tissue soldering. J Endourol 2003; 17(5):295-300.